The TF20 folding treadmill utilizes a 2.75 CHP digital drive system and a durable 2-ply maintenance-free belt. The workout area is a comfortable 145 x 51 cm/ 57" x 20", and the all-new frame consists of heavy-gauge steel tubing and extended support rails for added stability. Our Classic treadmill console features a large LED display for easy viewing, as well as five preset programs to help get you started on your workouts right away. The TF20 is also compatible with the Passportâ„¢ media player, which is sold separately. 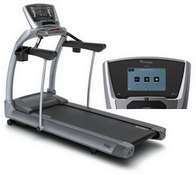 The TF20 is perfect when you want a high-quality, low-maintenance folding home treadmill. It features our Infinity Deck System, which uses the durable cushioning found in commercial treadmills and our wax-infused belt that never needs lubrication. Pair it with the all-new Elegant+ touchscreen console to get innovative features like our exclusive ViaFit system that tracks your exercise data and shares it with your favorite fitness apps and social networks. Or try the science-based Sprint 8 High Intensity Interval Training workout that requires just three 20-minute workouts per week. The TF20 is ideal for runners who want a high-quality, low-maintenance folding home treadmill. It features our exclusive Infinity Deck System, which uses durable commercial cushioning along with our wax-infused belt that never needs lubrication. Pair it with the top-of-the-line Touch+ console to get the best in workout programming and your favorite entertainment. The large, high-definition touchscreen display is easy to see and operate. Plus, it comes with ViaFit, which automatically tracks your workout data and shares it with your favorite fitness apps and devices. 60" x 20", and the all-new frame consists of heavy-gauge steel tubing and extended support rails for added stability. Our Classic treadmill console features a large LED display for easy viewing, as well as five preset programs to help get you started on your workouts right away. The TF40 is also compatible with the Passport media player. It features our exclusive Infinity Deck System, which uses durable commercial cushioning and our wax-infused belt that never needs lubrication. Touchscreen console offers innovative features that help you maximize your workouts. Our ViaFit system automatically tracks your exercise data and shares it with your favorite fitness apps and social networks, while the science-based Sprint 8 High Intensity Interval Training program helps you build fitness just three 20-minute workouts per week. With a powerful motor, spacious deck and heavy-duty frame, the TF40 can handle intense workouts. It comes with our exclusive Infinity Deck System, which uses durable commercial cushioning and features our wax-infused belt that never needs lubrication. When you add the large, high-definition Touch+ console, you also get the best in entertainment and programming. The science-based Sprint 8 High Intensity Interval Training workout requires just sixty minutes a week. You'll also get ViaFit, which tracks your workouts and shares them with your favorite fitness apps and social networks. 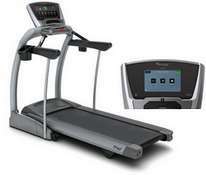 With a 3.0 CHP digital drive system, the T40 treadmill delivers smooth, consistent power, even at lower speeds. The extra-long 152 x 51 cm/ 60" x 20" running surface provides the most room to move. Heavy-gauge steel tubing and extended support rails provide extra stability for confident workouts. Our Classic treadmill console features a large LED display for easy viewing, as well as five preset programs to help get you started on your workouts right away. The T40 is also compatible with the Passport media player, which is sold separately. This non-folding treadmill features our exclusive Infinity Deck System, which uses durable commercial cushioning our maintenance-free, wax-infused belt. When you pair it with the Elegant+ touchscreen console, you get features that make your workouts more effective. Our exclusive ViaFit system automatically tracks your exercise data and shares it with your favorite fitness apps and social networks, while the science-based Sprint 8 High Intensity Interval Training workout gets you fit in just three 20-minute workouts per week. The new T80 treadmill was designed and engineered to withstand hours of use in a commercial setting. A spacious, 55.9 x 152.4 cm / 22" x 60" running surface and 3.0 hp AC motor provide a smooth, comfortable workout. 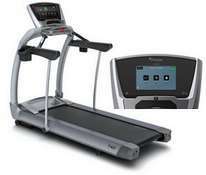 When equipped with the easy-to-read Classic console, the T80 provides a solid, durable treadmill that is simple to use in commercial environments and heavy-use home settings. Tough enough for commercial use but refined enough for your home, the T80 treadmill is the perfect blend of performance, durability and style. The powerful motor and roomy deck support your training, while the large, high-definition touchscreen delivers your favorite entertainment, like Virtual Active workouts that travel through the American Northeast and the Northern Rockies. You can also vary your workouts and get better results with effective programming, like the science-based Sprint 8 High Intensity Interval Training program that gets you fitter faster. Arizona Extreme Fitness will deliver and setup your favorite quality Vision Fitness treadmill in Prescott, Flagstaff, Sedona and Phoenix, Arizona at your location! Come on in and browse our 3000 sq ft warehouse showroom in Prescott Valley, Arizona and try before you buy or if you already know what you want just call us for our best price and we will deliver or ship it to you depending on your location in the USA. We sell, deliver, setup, install and service the above quality brand Vision Fitness treadmills.